Done with Neximage 5 and LX90 ACF 10"..
That is really nice! I can really see a lot of different things in that image. Good color. 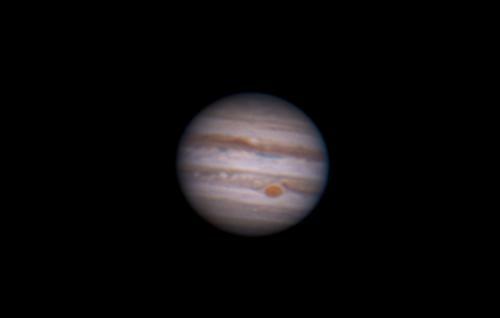 Interesting dark spot on the left end of the Great Red Spot, plus lots of white spots to the left of the GRS. If you are not proud of that one, you need to be! WOW! That's beautiful! I am assuming that was shot with an eyepiece projection. What eyepiece and type of camera did you use? Thanks! It was done with Neximage5 at prime focus and Binning disabled on camera..No eyepiece projection, just Neximage5 stuck in the end of the Meade..I want to get a ZWO camera soon because I feel I have reached the limit with the Neximage5.. Thanks everyone! I took 100 gigs of video Tuesday night..I got some of the best shots I have ever gotten of Jupiter..I will be posting more..
That is amazing, given Jupiter is only about 40 arcseconds wide at prime focus. Looking forward to more shots! I have heard around the forums that the Neximage5 camera with binning disabled, is equal to a 6 or 7mm eyepiece..I have no idea if that is true or not..
Great work as always, you just keep getting better and better. I also think photos like yours speak volumes for the LX90. THAT is a huge advantage over a DSLR camera, in my opinion.